In the fall of 2003, freelance journalist Annia Ciezadlo spent her honeymoon in Baghdad, filing war stories alongside her Lebanese husband while making pasta puttanesca in their in-room kitchen. 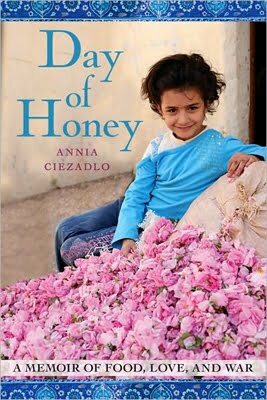 Day of Honey is the story of their courtship and marriage, of the two wars that they lived and worked through, and an examination of the role food plays in both love and war. The title is drawn from an Arabic proverb: “Day of honey, day of onions.” That cycle of sweetness and grief, pleasure and tears suffuses every page here. “Many books narrate history as a series of wars. . . . I look at history as a series of meals,” Ciezadlo writes. She traces her own wanderlust to a vagabond childhood with a single mother that included time spent in a San Francisco homeless shelter, facing down a block of tofu. Her husband was uprooted by the civil war in Lebanon as a child and grew up in New York, where the two met. When his job sent him to Pakistan six days after the 9/11 attacks, Ciezadlo dragged friends to a series of kebab houses, keeping him near by recounting all his dietary quirks to anyone who would listen. The book brims with Middle Eastern history, but it’s the small details that tell the story: the Iraqi man who expounds on the greatness of Chicken Soup for the Soul; neighborhoods destroyed by war that sprout rooftop and terrace gardens; bars and cafes where Sunnis and Shiites might sit at the same table and share a meal, then leave and come to blows. Capped off with a collection of mouthwatering recipes, many from Ciezadlo’s larger-than-life mother-in-law, Day of Honey turns thoughts on food into provocative food for thought. disclosure: I received this book free from Book Blogs in exchange for my review.